The wildfowl counts tables feature the eight most regularly occurring species at Eakring Flash and Eakring Meadows. Geese are not included. For many species, their status has changed quite dramatically since counts began in early 1998 to the end of 2010. The table shows the combined wildfowl counts from 1998 to 2010. Mallard and Teal rather typically dominate the records. The table also shows how species variety increases during late February, March and April, prior to the breeding season. However, to gain an accurate picture of how wildfowl numbers have dropped at Eakring, prior to late 2009, compare the wildfowl counts table for 2008 with those of the early 2000's. Another poor year, with the unusually high Mallard count likely through birds being introduced during the Summer for shooting purposes in the Winter. There was generally a wide range of species noted during the early part of the year, and notable was breeding Shelduck at two sites in the area. 2009 seemed as though wildfowl counts throughout the year would continue to decrease, but October, November and December saw a return to similar counts of around a decade ago. This was through a recommendation to cut back some of the surrounding Sallow growth, opening up the flash and increasing Eakring Flash's attractiveness to wildfowl. The effect was virtually instantaneous and resulted in peak counts of 103 Mallard and 62 Teal in November. Yet another very poor year, especially during the Autumn and first part of the Winter months. In fact Teal had their worst year ever here, but there were good numbers of Wigeon noted in January, although these birds spent most of their time on Bilsthorpe Pit Top. The poor Summer led to very few broods of any species, with only no successful Gadwall breeding and Mallard broods totalled only just four. Each year seems to be getting progressively worse for wildfowl here. Although all of the regular eight species turned up, there were no Summer, Autumn or early Winter records of Pochard (not seen at all after March) and Tufted Duck (not seen after May) The extremely high Teal count for December is misleading. It relates to 108 birds moving south-east, with around 30 coming down on Eakring Flash. There were welcome records of a single Wigeon and a group of six Pintail in September. 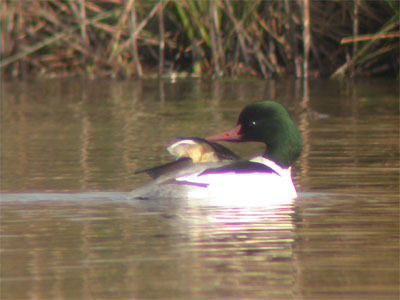 Goosander peaked with counts of five in both February and March. Ruddy Duck failed to appear during 2007. Another poor year, with no records of any of the rarer duck and none of Wigeon for the first time. Only three species were recorded during the October-December period, these being Mallard, Goosander and Teal. Teal was completely absent during the worst December ever. On the plus side - at least three Ruddy Duck again survived the national cull. Counts of Mallard and Teal were well up on those of Jan/Feb 2004. Once again, it was the Spring period which produced the greatest species' variety, but breeding pairs of each were slightly down on last year. There were no rare wildfowl during the year, apart from a single Shoveler in August. The year represented one of the poorest ever recorded. There were low counts of all species, with Gadwall being the only exception. Gadwall has been showing an increase for the past few years (especially during the first two months of the year) and good counts have again continued into the early part of 2005. A decrease in both migrant and breeding Tufted Duck (evident since 2000) continued during 2004. Why this should be is unclear, especially when Pochard has remained fairly consistant in it's occurrences in the area. Although some shooting again took place at Eakring Flash, it did not appear sufficiently responsible for the lack of wildfowl there during November and December. Teal which used to appear there in good numbers, are now more regularly found further east at Eakring Meadows. Whether this is a direct result of shooting disturbance over the past two years is unclear. There were no rare species seen during 2004 (aside from a drake Mandarin in December) but a large part of this, may be due to a lack of coverage at certain times during the year. Afternoon/evening shoots at Eakring Flash continued the tendancy for all species to winter in lower numbers than was becoming usual beforehand. Teal were especially affected towards the end of 2003 and counts were well below those reached during the corresponding period the year before. The actual number of days when Teal were present, was also much lower than at any time since 1998 and rather than numbers being almost continuously swelled by a constant arrival of other birds, groups of Teal were extremely sporadic in their appearance. It was a similar situation with all other wildfowl species. The latter months of 2003 were occasionally almost devoid of any ducks at all, but the period March-May, again saw the greatest variety of species present at Eakring Flash. The rarest duck of the year was the single Pintail present briefly on one September morning and a flock of 28 Wigeon flying north-west, was the highest count here since 1999. Another scarce species (the Shoveler) favoured Eakring Flash for a relatively lengthy period in the Autumn, again showing the general increase in appearances of recent years. The graph for 2002 shows how the continuing maturing of Eakring Flash is now attracting species more regularly throughout the year. Apart from January's record Teal count of 150, no other record counts were achieved. Breeding successes involved Shelduck and Mandarin (breeding firsts) Tufted Duck, Mallard, Gadwall and Little Grebe (another breeding first) though yet to breed at Eakring Flash. Ruddy Duck again remained present through the Summer months. Rarest wildfowl of 2002 was the area's second-ever record of Garganey - another August juvenile. Teal, Shoveler and Pochard, all produced record counts during 2001 and two new species were added during the year. Both of these, had been expected as fly-over records only (Eakring Flash not being thought of as big enough) but both Pintail and Bewick's Swan both came down on the water, with the latter species, making an extended stay by a family party of four. Little Grebe were virtually ever-present and Ruddy Duck may have attempted breeding, but this could not be confirmed. Gadwall and Tufted Duck, once again produced broods for the second year. The year provided only one new record count, that being of Ruddy Duck, which also became increasingly more regular during 2000. Counts of wintering Teal increased for the third consecutive year and again, there was one Summer record, but Shoveler remained scarce, despite the three records. Goosander, on the other hand, continue to find Eakring Flash attractive, with counts of eight being reached in January and February, during periods of colder weather. Egyptian Goose was a surprising new addition for the area in April, when a pair were present for one day only. There were four new record counts, as can be seen from the high-lighted figures in the 1999 table above. Perhaps the most remarkable single record, was the influx of Gadwall, at the beginning of September. The high Wigeon count was primarily made up of one large fly-over flock, but Eakring Flash, proved once again, to be attractive to small numbers. Not featured in the table are grebe records. With the site becoming more mature during the year, Little Grebe were recorded on many dates and look set to become a resident breeder, in the near future. Only the second grebe species to be recorded here, was a single Black-necked Grebe, which was present for a week in July. This occurrence and that of the August's juvenile Garganey, stands testimony to the ability of Eakring Flash, to attract rare and unusual species during the coming years. 1999 also provided the first ever record of Ruddy Duck and first breeding success for Tufted Duck and Gadwall. With this being the first full year's coverage since the creation of Eakring Flash in 1997, it remained something of an unknown quantity as to what species may be expected. The only available guideline, were the species recorded during the latter days of that year. The small water area, meant it doubtful that certain species would occur, but this theory was proved wrong and species like Wigeon, Goosander and Shelduck, all occured in surprising numbers. Shoveler remained scarce, with only one record and July produced just two species throughout the enitire month..
One of the finest species to be found here is the Goosander. Eakring Flash has always attracted them in better numbers than I imagined at the onset of recording. Site maxima of eight birds have been recorded on a couple of occasions and peak occurrence dates are from late December through to early March. Ten moving north-east in May 2004 though, remains the highest-ever count. Most records come during spells of colder weather within this time period, but the numbers of birds in relation to actual site records, increases noticably during February and March. This is highlighted in the above chart where the blue columns give the cumulative highest counts achieved over five years, whilst the red columns show the total number of birds involved. 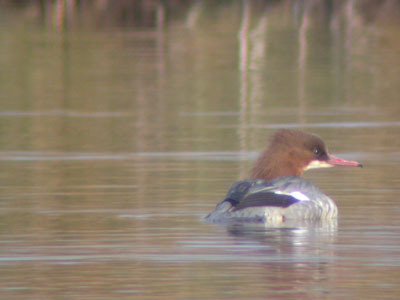 Inclusive dates for Goosander here are November 5th 2001 and April 7th 1998. Records during these months are few (two November; one April record) and these dates are early and late respectively. Records become increasingly regular from around Christmas time. Little Grebes have always been regular in their appearences at Eakring Flash and the much smaller Kersall Pond, just south of Kersall village. Throughout the period, Eakring Meadows has surprisingly produced just one record, when a single bird was present on floodwater at Penny Pasture Common in October 2001. Breeding finally took place in the area during 2002, when a pair bred at Kersall Pond and it must only be a matter of time before Eakring Flash finally holds successfully breeding birds. A pair did construct a nest in 2003, but the attempt failed after a week. Eakring Flash is though, the most regularly visited site here and counts over the years have gradually increased. From March-October, birds are almost continually present. There is a good turn-over of individuals making up these records and adult/juvenile ratios can vary on an almost daily basis during the late Summer period. The chart above clearly shows the two main periods of Little Grebe occurrences at Eakring Flash from 1998-2002. The August peak involves a greater percentage of post-breeding adults than one might suppose. There was just one over-wintering record during the time.